Motorsports are risky, so employing an experienced medical response team is crucial. Fujifilm SonoSite recently became an Official Supplier of the Bennetts British Superbike Championship (BSB) 2018, and the SonoSite iViz became a valuable addition to the medical team’s toolbox for enabling rapid assessment to help triage injuries and identify complex medical conditions, either at the trackside or in the mobile clinic. So how does the SonoSite iViz fit into this carefully choreographed medical response? Here are four ways the SonoSite iViz contributes to excellent health care services at Bennetts British Superbikes. The medical team’s first priority after an incident is to stabilize the patient at the trackside before potentially transferring them to the medical center for further triage and treatment. One of the straightforward and time-critical applications of POCUS is to provide an early warning of a pneumothorax before clinical signs develop, determining whether a patient should be transferred to the hospital. On the rare occasion that the medical team must treat a rider with multiple injuries, ultrasound can also be used to carry out a FAST exam to identify any internal injuries, such as cardiac tamponade, in order to accurately triage the patient’s injuries. A bone fracture can be excruciating. This season, the medical team is considering the potential for ultrasound-guided femoral nerve blocks, which can make transportation to the hospital more comfortable for a patient with lower extremity fracture. One of the medical team’s main goals is to lessen the burden on the NHS by pre-empting critical emergency services and communicating with the receiving hospital before patient transfer, making the entire process more efficient. Ambulance and NHS services are already stretched in the UK, and adding to the case load with entirely optional sporting even injuries wouldn’t be prudent; the more that the medical team can do before the rider arrives at an emergency room, the better. The BSB medical team is committed to learning everything they can about a racer’s injuries and status before beginning transport to the hospital. High-speed crashes at a Superbike Championship are seen by nearly every spectator, including the participant’s family and friends. Faster diagnostics via ultrasound will offer the family efficient information on a patient’s well-being. 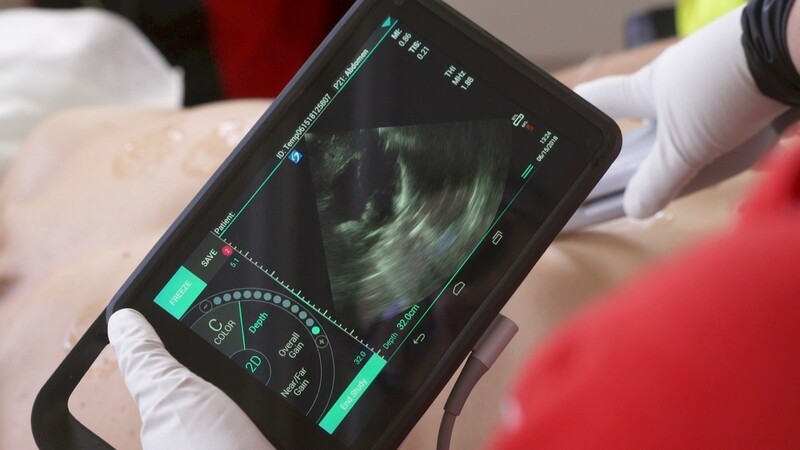 The SonoSite iViz isn't an off-the-shelf mobile ultrasound tablet. See what three ER physicians say about the SonoSite iViz, a powerful diagnostic tool built to withstand 3-foot drops and be used with just one hand.